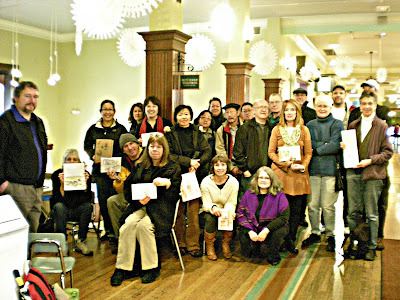 A great day sketching at Wallingford Center! About 25 of us came out, not everyone could stay long enough to be in the picture! Fun to see the group's sketches of people, clothing, hats, signs, windows, architecture, cupcakes! Hope to see them up here soon! Here is my tastiest sketch of the day, chocolate/graham cracker cupcakes with roasted marshmallow frosting. I loved this sketch. Wonderful colors and graphically beautiful. I love this one too -- my mouth is open to take a bite! Wonderful sketch and colors! Thank you for being there and taking the group photo. Great experience. 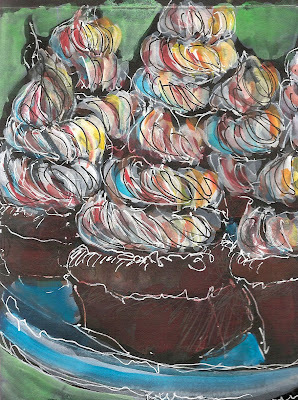 Your style and lack of fear when it comes to color makes cupcakes the perfect subject to sketch! Not a calorie out of place.